How good the TS-5? Statistical data! TS-5 basically gives 3-4% extra winrate to players. So now you know how good the TS-5 and you may use the last days to buy it. 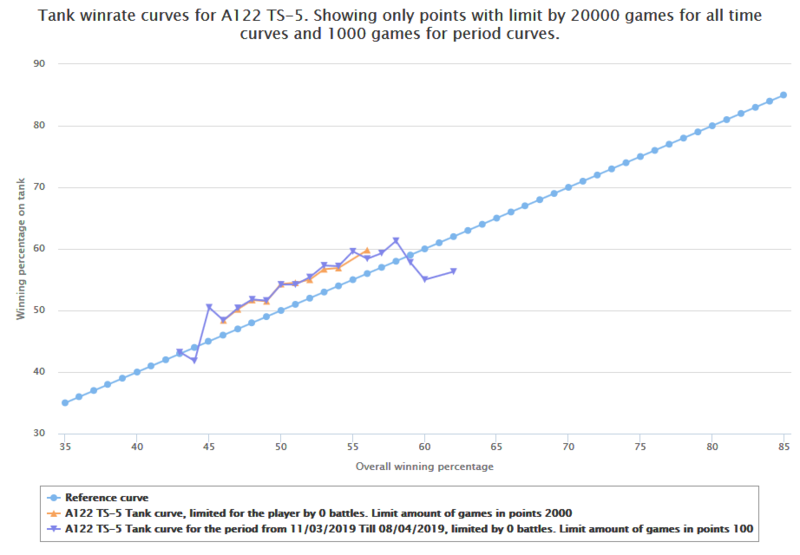 This shows the TS5's winrate of a player vs the average winrate of the same player. I doubt this data means anything.. This makes it look like your win-rate on the tank will be same as your own win-rate. It's same as people complained about the wheelies being OP and giving players higher win-rate then they should have, while their info was only based on short terms. A lot of players don't know the weak-spots on the tank, so this gives advantage to players who play with it now. Same was the fact that a lot of players didn't know how to responds to wheeled vehicles when they just came out. That'll change over the next few weeks in a downward direction as players learn how to respond to it. Stats are so good because tank is new and people don't know where to shoot it yet. Give it a couple of days. Everyone pens my lower plate but I manage to bounce theirs. Why do I always get the monday-made ones. Give it 2 months, and then look at the most recent data, excluding the first month. Ppl will learn it's weakspots, it's weaknesses, and how to deal with it. T28 is far far better than TS-5. Just wait till people learn how to deal with it. That WR will take a nose dive. Today I managed to rip multiple TS-5s to pieces in my T28. People will also learn how to counter it. And most folks don't know how to properly angle their own TS-5. Data like this soon after vehicle was introduced is worthless. Wait few months and then check it.